are the Answer to your Storage Needs. 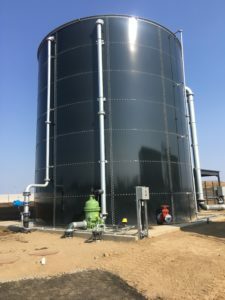 Glass-Fused-to-Steel Bolted tanks are created by fusing of two materials to achieve the best properties of both – the strength and flexibility of steel and the corrosion resistance of glass – providing many advantages over standard epoxy coated or welded painted storage tanks. The glass lining forms a hard, chemically inert layer that permanently protects the steel surface from rust, corrosion, undercutting, abrasion and stains. In addition, UIG’s proprietary ECO-Glass coatings are specifically engineered around your application from pH zero to pH 14 providing even more corrosion resistance. The Glass Fused-to-Steel construction of these bolted tanks is exceptional for the storage of potable water, waste water, petroleum, chemicals and dry bulk an in such applications as reservoirs (open top or with aluminum dome or flat panel roof), power generation stations, standpipes, frac processing, fish ponds, sludge tanks, trickling filters, high temp fermentation plants. They are used in many different applications such as waste water treatment plants, biogas plants and petroleum tank farms where steel corrosion would be an issue. Glass Lined Tanks are quick to manufacture and can be erected easily in the field with our experienced crew or by utilizing a supervisor and local labor. Pair with our UIG Aluminum Dome Cover for virtually maintenance free storage. can benefit your next project in terms of cost savings and quality. Glass Fused-to-Steel Bolted Tanks are an exceptional choice for use as water storage tanks, waste water tanks, leachate storage and chemical storage. 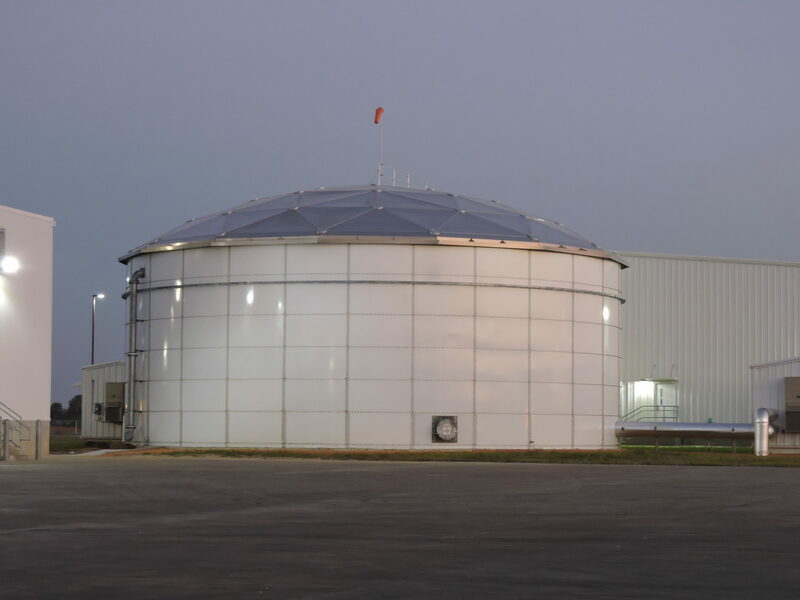 UIG Glass Lined Storage Tanks not only conform to the AWWA D103 standards but FAR EXCEEDS the standards by providing a stronger, safer product. Often manufacturers disguise their specifications as the AWWA D103 standard and many times the writer of those specifications put in extraneous requirements to weed out the competition and give the buyer fewer, if any, other choices. This tactic is not to the benefit of the project owner. 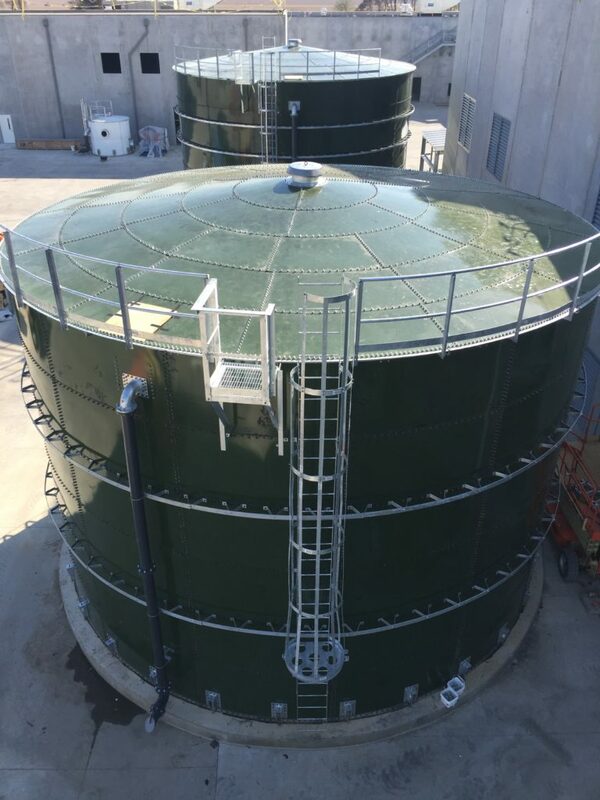 Your UIG Glass Lined Tank Specialist can explain to you the differences between the current AWWA D103 standard and a specification written by a manufacturer. UIG uses proprietary Titanium (Ti) rich Hot Rolled Carbon Steel (TRS) which is specifically manufactured for the enameling process. This allows for exceptional physical performance and eliminates any fish scale defect. Furthermore, the superfine glass structure of the enameled layer provides the steel plates with excellent flexibility and durability. Other manufacturers choose a poorer quality A36 Carbon Steel base (not recommended for durable and quality glass fused bonding), which is the least expensive steel and contains levels of carbon that will make it difficult for good glass adhesion. Many manufacturers apply a toxic nickel oxide to cover up the carbon defect in inferior steel in order to apply their two-coat/two-fire enameling process which will leach through any pinholes. As a result, they end up with a thicker coating that has the tendency to fish scale, sag, has low adherence and cracks easily. UIG’s glass coatings increase the role of the base metal’s mechanical properties, providing a harder, more flexible, less brittle and greater chip resistant tank panel. UIG’s proprietary enamel frits and titanium-rich steel (TRS) provides unparalleled adhesion. Proper coating thickness is key to elasticity and longevity. We make also our own glass frits for the enameling process so we can match the color YOU WANT for your tank. Most manufacturers use the same fin-necked bolts to assemble their glass lined tanks as they use for their epoxy coated tanks. Epoxy tanks may be touched up in the field which allows for the use of these types of bolts, but using these same bolts on glass lined tanks allow the fins to bit into the enameling leading to cracking and scratches which can cause rusting inside the tank. 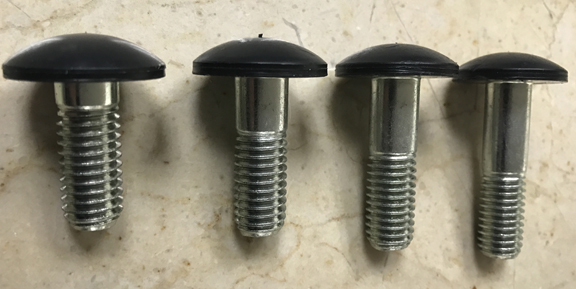 UIG’s proprietary finless bolts are safe to use with glass fused-to-steel bolted tanks and do not crack the enamel during the installation process. Sheet edges must be properly coated with the same enamel material in order to avoid electrolysis of dissimilar metals, rust and weakening of the enamel bonding. UIG rounds the edges of their plates and coats the edges completely. To save time and costs, other manufacturers leave sharp edges on their panels and they coat them cosmetically with a stainless steel strip. This creates a contact between two dissimilar metals (CS and SS) which will lead to electrolysis of two dissimilar metals and therefore early corrosion inside the tanks. 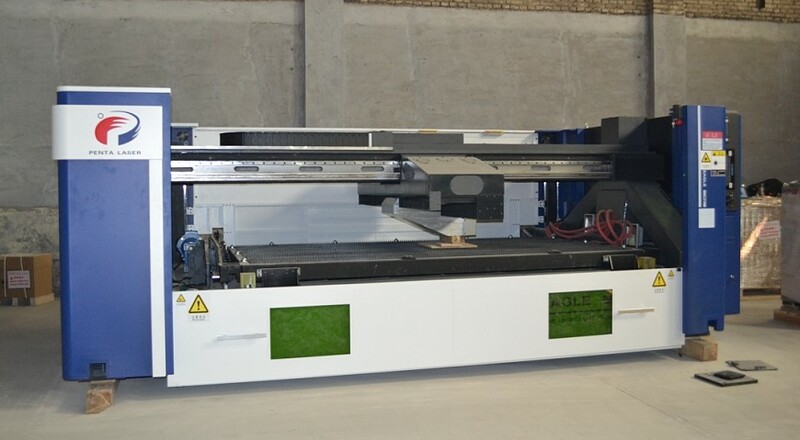 Laser Cutter in UIG manufacturing plant used for precisely cut bolt holes and openings in bolted tank panels. Corrosion Resistant Enameling gives superior strength and durability. Tanks are engineered and fabricated under strict quality control conditions to provide a precise fit in the field. 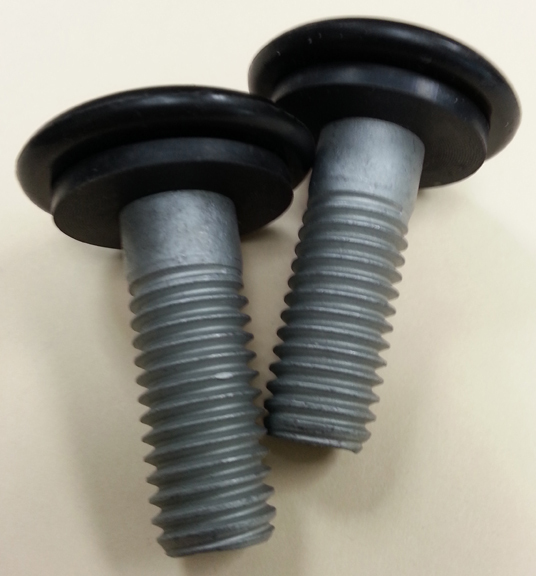 Proprietary finless bolts protect glass coating from damage during installation. Designed and fabricated per AWWA, API, NSF 61, NFPA, IBC, EPA, DIN, ISO, ASTM, OSHA, UBC Seismic and other national and international standards. Rounded plate edges allow enamel encapsulation of the entire panel not just the front and back sides. Proprietary titanium rich carbon steel eliminates “fish scaling” and prevents corrosion. Many deck options available: Glass, Aluminum Dome, Fiberglass, Plastic Trough or Open Top with Bridges and necessary structures for Wastewater Treatment Systems and others. Built high or low profile on any surface, inside buildings or outside. Expandable and easy to relocate. Accessories available to suit any project requirement – Mixers, Heaters, Insulation, Sonic Level Indicators, SCADA.